As an educational tool, this is amazing. In just the first 15 minutes we get to see the history of aviation develop from disastrous first attempts at gliding to the Wright brothers' first successful powered flight. But it doesn't stop there. In the second half we see aviation take its first faltering steps - the Wrights continue to refine their design, but others are flying now too. And because the Wrights are content to do their work in private, their achievement is disputed. Even the American press doesn't believe they've flown. And when the Brazilian-born Alberto Santos-Dumont gets his own plane up in the air, he claims the title "first man to fly." It seems as if the Wrights "have lost their place in history." It's all here: tension, amazing inventions, and loads of historical detail packed tightly into just a half hour package. On top of all that, this is entertaining too. Our whole family loved it, though for different reasons. My wife and I were fascinated by the history, and our children, from 2 to 6, were swept along by the story. This would be an unmatched resource for schools, and it's also good fun for the whole family. 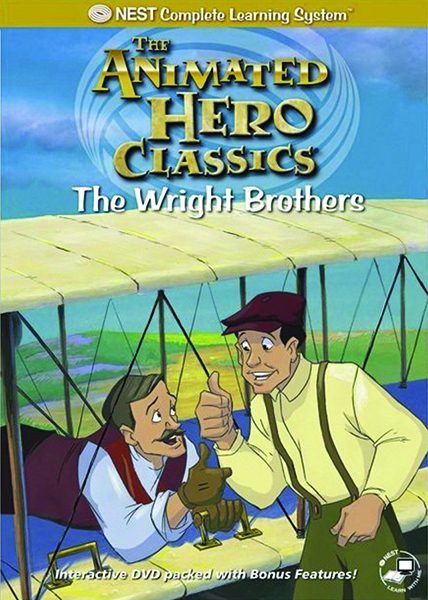 The Wright Brothers is good enough to send parents and teachers looking for others in this "Animated Hero Classics" series so I wanted to add a warning. Not every film in the series is good: other gems can be found, but stinkers too (we were all quite bored by the one on Leonardo da Vinci). So don't buy others without doing your research (especially since they are quite expensive). If you want to get your own copy of The Wright Brothers you can find it at Amazon.com by clicking here.